VANCOUVER - A man who was accused of gouging out the eyes of a University of British Columbia student who had returned home to Bangladesh has died in prison in the South Asian country, according to local media reports. 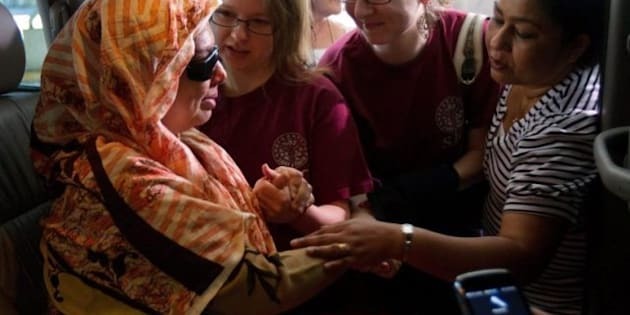 Hasan Sayeed Sumon was charged with attempted murder after his wife, Rumana Monzur, a graduate student in political science, was blinded and disfigured during a trip home to Dhaka, Bangladesh. Several media outlets reported Sumon died Monday at a jail in Dhaka, though it wasn't immediately clear what caused his death. Sumon had denied attacking his wife. Monzur, a Fulbright scholar in her early 30s, said her young daughter witnessed the attack on June 5 when her eyes were gouged and her nose bitten. She returned to Canada with her father a month later to seek treatment and finish her studies. Doctors in Vancouver examined her eyes to determine whether her vision could be restored. Monzur underwent four surgeries, but in the end doctors concluded her eyes were too damaged to be repaired. Meanwhile, the university and her fellow students raised tens of thousands of dollars to cover Monzur's medical and living expenses as she completes her studies. Monzur's case has prompted rallies and petitions both in Canada and in her home country of Bangladesh, where a high proportion of women face violence. A study released by the United Nations Population Fund in 2000 indicated half of women in Bangladesh experience domestic violence at least once in their lives.